This CSO outfall, which formerly discharged 1.35 million gallons of combined sewage at Boston's Constitution Beach per year, was closed in 2000. Not all sewer systems are created equal. 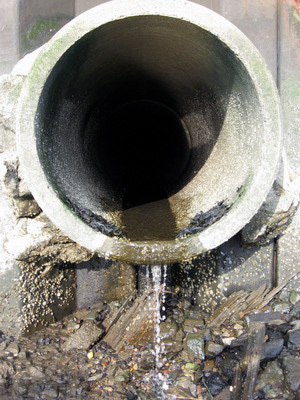 While modern systems transport rainwater and sewage from homes and businesses through separate pipes, some older systems like Boston's have "combined" sewers that carry both flows together. During normal conditions flows are delivered to treatment plants. During very heavy rains, when flows sometimes double and even triple, these systems become overloaded. Built-in overflows (called combined sewer overflows or "CSOs") must then act as relief points by releasing excess flows into the nearest body of water. This prevents sewage backups into homes and onto area streets, but the discharges can impact water quality. Most of the active CSOs in MWRA's service area receive treatment such as screening, disinfection and dechlorination. CSOs occasionally discharge a combination of rainwater and sewage into Boston Harbor, the Charles and Mystic Rivers, and Alewife Brook. Public health officials recommend avoiding contact with active CSO receiving waters during rainstorms and for 48 hours afterwards as there may be increased risks due to bacteria and pollutants associated with urban stormwater runoff and CSOs. 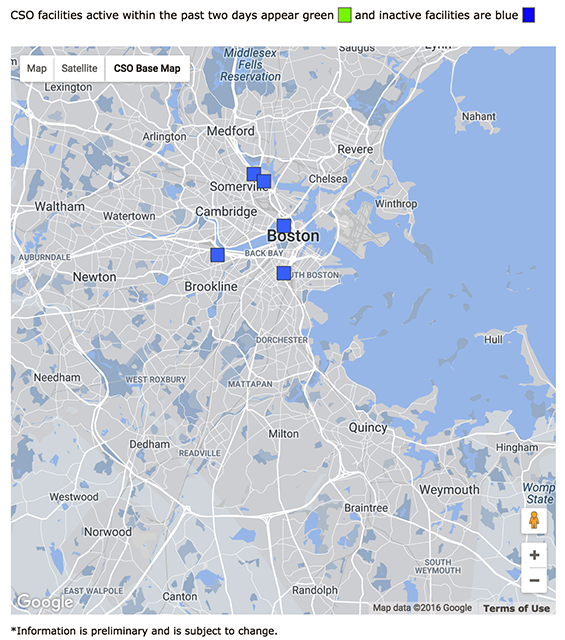 See map for the locations of active CSOs in MWRA's service area. Boston, Cambridge, Chelsea and Somerville have combined sewer systems that connect to MWRA's system. In 1987, a total of 84 active, uncontrolled CSOs discharged combined flows into Boston Harbor and into the Charles, Mystic Neponset Rivers. 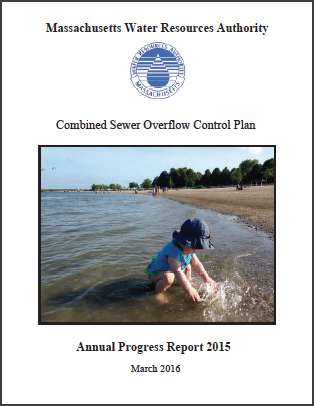 As of December, 2015 CSO discharges have been eliminated from 34 of the 84 outfalls and virtually eliminated from 5. All CSO Control Program construction projects are complete. Annual CSO volumes have been reduced by over 2.8 billion gallons a year. 34 of the 84 original CSOs have been closed and discharges from 5 outfalls have been virtually eliminated with a 25-year level of CSO control. 93% of remaining CSO flows receive treatment. Since MWRA was created in 1985, solving the problems related to CSOs has been a top priority. MWRA developed a CSO Control Plan in 1994. The plan has since undergone environmental review and received federal and state approvals, allowing the projects to move forward on a design and construction schedule mandated by the Federal Court as part of the Boston Harbor Case. The CSO Control Plan been revised over time to reduce cost and to make best use of improving technology. 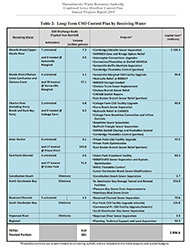 All of the 35 original CSO Control Plan projects have been completed. MWRA operates facilities that screen and chlorinate combined wastewater (sewage and storm water) prior to discharge or further treatment. MWRA's CSO facilities at Union Park (Boston), Cottage Farm and Prison Point (Cambridge) store and pump CSO flows. Screened and chlorinated wastewater can be stored and pumped back into the system for processing at the Deer Island treatment plant. Any treated wastewater that exceeds a facility's storage capacity is discharged through CSO outfalls. At the Somerville Marginal facility, combined wastewater flows enter and leave the facility by gravity, not pumping. The wastewater is screened, chlorinated and dechlorinated. The disinfected wastewater overflows into its receiving water as quickly as it arrives at the facility. Click on links for details about each project, including receiving water, cost, water quality benefits and more. Description: Separated common manholes connecting local sewer and storm drain systems. City of Somerville performed design and construction with MWRA financial assistance. Description: Installed approximately 14,000 linear feet of storm drain to separate the combined sewer system, removed stormwater flows from area sewers, and eliminated CSO discharges to Constitution Beach, allowing MWRA to decommission the Constitution Beach CSO treatment facility. 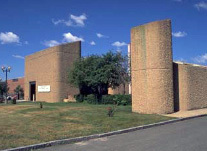 BWSC performed design and construction with MWRA financial assistance. Receiving Water(s): CAM005: Upper Charles River Basin. BOS017: Mystic River/Chelsea Creek Confluence. Description: CAM005: In Cambridge, the 40-foot long, 24-inch diameter dry weather connection between the CAM005 regulator and MWRA’s North Charles Metropolitan Sewer was relieved with a 54-inch additional connection. BOS017: In Charlestown, 190 feet of 36-inch diameter pipe were installed in Sullivan Square to divert two local (BWSC) combined sewers to a direct connection with MWRA’s Cambridge Branch Sewer. In addition, a 10-foot long restriction between the Charlestown and Cambridge Branch Sewers, adjacent to Sullivan Square, was eliminated. B(cso) water quality standards (>95% compliance with Class B) at CSO Outfalls CAM005, BOS017. Description: Replaced 18-inch diameter city-owned trunk sewer with 30-inch pipe, relieved MWRA’s Chelsea Branch and Revere Extension Sewers with 48-inch to 66-inch diameter pipe, rehabilitated Outfall CHE008, and installed underflow baffles for floatables control at all outfalls. with Class B) at outfalls CHE002, CHE003, CHE004, CHE008. These projects improved treatment performance, but did not affect treated discharges' frequency or volume. Description: Stormwater piping and appurtenances to relocate stormwater dischargers from Pleasure Bay to Reserved Channel. Description: Installed 74,000 linear feet of new storm drain to remove stormwater runoff from local sewers serving a 609-acre area in Jamaica Plain, Mission Hill and Roxbury, and disconnected an already-separated storm drain system serving an adjacent 548-acre area from the sewer system. with Class B) at MWR023 (Stony Brook Conduit). Description: Removed stormwater runoff from local andMWRA combined sewers by installing 4,550 feet of new storm drains serving 55 acres in the Fort Point Channel area. Also overflow weirs were raised, at BOS072 & BOS073. At both locations new tide gates were installed, and underflow baffles were constructed for floatables control. Projects involved floatables controls and regulator or outfall closings that are independent of the larger projects. The project affected various outfalls system-wide. In March 2000, MWRA closed Outfalls MWR021 and MWR022 to CSO discharges. floatable material. Eliminated CSO discharges at select outfalls. The floatables controls did not affect CSO discharge frequency or volume. Description: Added CSO treatment facility to existing BWSC Union Park Pumping Station with fine screens, chlorine disinfection, dechlorination, and 2 million gallons of detention storage. Water Quality Benefit(s) Provided treatment of Union Park pumping station discharges to Fort Point Channel at BOS 070 to meet Class B water quality criteria, including residual chlorine limits, and lowered discharge frequency and volume with on-site detention basins. Description: Installed twin-barrel 10’x17’box conduit to provide 670,000 gallons of off-line storage, between Chelsea St. and the Mystic Tobin Bridge, Charlestown. Included above ground dewatering Pump Station. Water Quality Benefit(s) Reduced treated CSO discharges into the Upper Inner Harbor. Water Quality Benefit(s) Minimized treated CSO discharges to the Charles River Basin at MWR201. Description: Installed 2,800 linear feet of 12-foot by 12-foot box conduit for stormwater conveyance, with gated connection to North Dorchester Bay CSO Storage Tunnel at upstream end, new outfall to Savin Hill Cove, and pollution prevention measures. Description: Installed 4,500 linear feet of of new storm drain and and special structures. Performing TV inspections and sewer cleaning. Water Quality Benefit(s) Reduces CSO discharges to the Charles River, especially at MWRA’s Prison Point CSO facility, and allows BWSC to eliminate CSO discharges at Outfall BOS049. When the isolation of the outfall is complete, BOS049 will no longer discharge to the Charles River Basin. Description: Upgrade of MWRA’s 115-year-old interceptor system serving most of East Boston, using a combination of construction methods: microtunneling, pipebursting, open-cut excavation and pipe relining. Water Quality Benefit(s) Reduces CSO discharges to Boston Harbor and Chelsea Creek through outfalls BOS003 and BOS014. Description: Upgraded the hydraulic capacities of City of Cambridge connections to MWRA interceptors and installed underflow baffles for floatables control. Description: Replaced common storm drain and sewer manholes with separate manholes and associated piping in the local, mostly residential streets bounded by Alewife Brook Parkway, Massachusetts Avenue, Magoun Street and Whittemore Avenue, as well as a portion of the WR Grace property off Whittemore Avenue. Eliminated CSO discharges to Alewife Brook at Outfall CAM400. Description: Constructed a 10,832-ft., 17-ft. diameter soft-ground tunnel, drop shafts and CSO and stormwater diversion structures along outfalls BOS081-BOS087; 15-mgd tunnel dewatering pump station at Massport’s Conley Terminal; 24-inch force main; and below-ground tunnel ventilation and odor control facility at the upstream end of the tunnel. 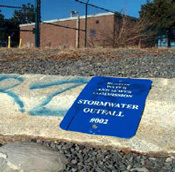 Eliminated CSO and separate stormwater discharges up to the 25-year storm and 5-year storm, respectively. Over 70 acres separated, total. Installed over 9,448 linear feet of storm drain, and 5840 linear feet of sewer. MWRA outfalls cleaned. Supports attainment of long-term CSO control at the Cottage Farm CSO facility. Description: Constructed a new 4-foot by 8-foot box culvert storm drain to convey the separated stormwater to a new 3.4 acre wetland in the Alewife Brook Reservation. The wetland will provide 10.3 acre-feet of detention storage of stormwater flows and the attenuation of stormwater flow rate to the Little River and Alewife Brook. Supports the CSO benefits of CAM004 Sewer Separation. Description: Upgraded the size of the local sewer connection between City of Somerville’s Tannery Brook Conduit and MWRA’s interceptor system and installed an underflow baffle to control the discharge of floatable materials. Description: MWRA replaced the original static overflow weir with an automated weir gate; replaced the 30-inch diameter Rindge Avenue Sewer overflow siphon with a 48-inch diameter siphon; and installed an underflow baffle for floatables control. The project improves the balance of flows in MWRA’s twin interceptors and provides greater system relief in large storms, in part to compensate for the closing of Outfall CAM004. Together with other Alewife Brook CSO projects, minimizes CSO discharges and their impacts to meet Class B “fishable/ swimmable” criteria >95% of the time. Description: BWSC installed 81,200 linear feet of new sewer and storm drain to separate the combined sewer systems serving a 365-acre area of South Boston tributary to four CSO outfalls along the Reserved Channel. Minimizes CSO discharges to meet Class SB(cso) water quality standards (>95% compliance with Class SB). Description: Cambridge installed 55,300 linear feet of new or rehabilitated sewer and storm drain to separate the combined sewers serving a 211-acre area of Cambridge east of Fresh Pond Parkway. With the project, the City of Cambridge permanently closed Outfall CAM004. 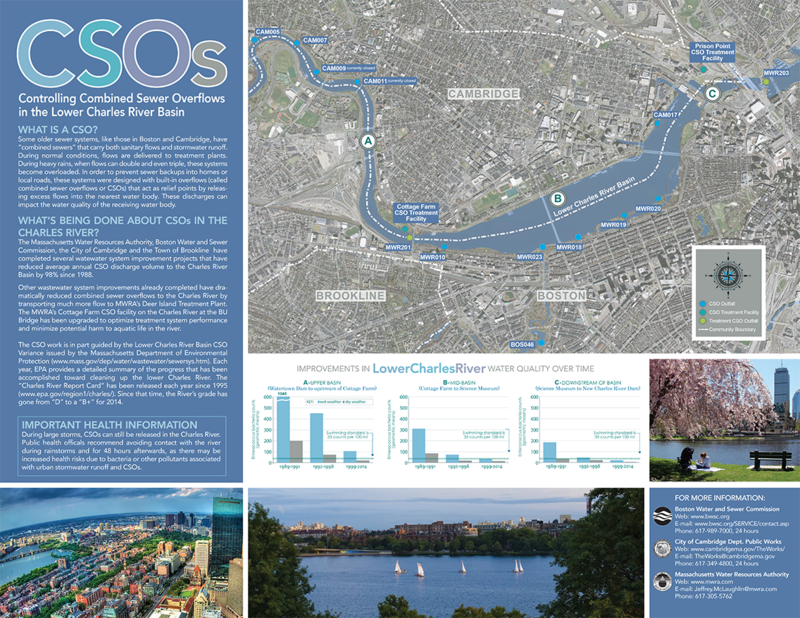 The Massachusetts Water Resources Authority, Boston Water and Sewer Commission and the City of Cambridge have completed a number of projects to reduce CSOs to the Charles River. These projects have already reduced average annual CSO discharge volume to the Charles River basin by 98% since 1988. The river is now generally safe for recreational boating. Healthy populations of river herring in the Charles provide the Division of Marine Fisheries with fish to stock other Massachusetts Rivers. Other wastewater system improvements have also dramatically reduced CSOs to the Charles River by transporting much more flow to MWRA's Deer Island Treatment Plant. Also, MWRA's Cottage Farm CSO facility on the Charles River at the BU Bridge has been upgraded to optimize treatment system performance and minimize potential harm to aquatic life in the river posed by discharges. The CSO work is in part guided by the Lower Charles River Basin CSO Variance issued by the Massachusetts Department of Environmental Protection. Each year, The US EPA provides a detailed summary of the progress that has been accomplished toward cleaning up the lower Charles River. The "Charles River Report Card" has been released every year since 1995. Since that time, the Charles River's grade has gone from a "D" to a "B" or highter since 2004. Besides implementing CSO control projects and conducting its own water quality investigations of the Charles River, MWRA has provided financial support to the Charles River Watershed Associations studies, and in the U.S. Geological Surveys Lower Charles River Project. 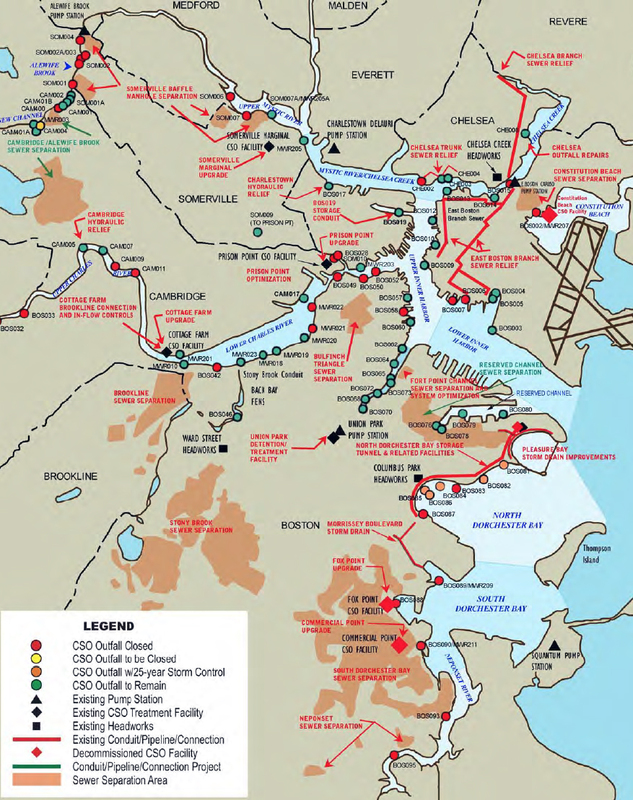 In 1990, MWRA and its engineering consultants recommended a $1.3 billion dollar CSO plan that called for an extensive system of pipes that would drop wet-weather flows into deep, bedrock tunnels where they would be stored temporarily until being pumped to Deer Island for treatment. In 1994, a second look at both CSOs and the entire sewer system brought a different solution. The new plan, with a price tag of approximately $906 million, is in keeping with new state and federal CSO policies and takes into account other MWRA facility improvements that also reduce CSO volumes and impacts. This plan recognizes that sewer system improvements have already reduced CSO volumes significantly and provided treatment for the majority of the remaining flows.